MARSHALL, Mich. – The Marshall Family Fare Supermarket will celebrate the grand opening of its Quick Stop location on Monday, Sept. 19. The fuel center will feature four pump dispensers, as well as a 1,464-foot convenience store with soft drink and energy drink options, hot foods and four daily blends of coffee and cappuccino. The $1.275 million investment by Family Fare’s parent company, SpartanNash, also resulted in the creation of eight jobs at the Quick Stop. More positions are expected to be created in the coming months. 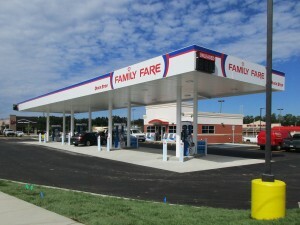 The Family Fare Quick Stop is located at 15975 W. Michigan Ave. in Marshall, directly in front of the newly remodeled Family Fare Supermarket. The Marshall Family Fare also marked its grand re-opening in February 2016, including upgrades to the meat, seafood, sushi, bakery and deli departments, all-new produce and floral sections and the addition of an in-store Starbucks. In total, SpartanNash has invested more than $2.3 million into its Marshall Family Fare Supermarket and Quick Stop in 2016. Starting Sept. 19 at 6 a.m. – when the Quick Stop officially opens for business – store guests can begin to redeem their yes Card fuel rewards, and associates will be on-site to assist customers. Quick Stop hours are 6 a.m. to 11 p.m., Monday through Saturday and 7 a.m. to 10 p.m., Sunday. SpartanNash (Nasdaq: SPTN) is a Fortune 400 company and the leading food distributor serving U.S. military commissaries and exchanges in the world, in terms of revenue. The Company’s core businesses include distributing food to military commissaries and exchanges and independent and corporate-owned retail stores located in 47 states and the District of Columbia, Europe, Cuba, Puerto Rico, Bahrain and Egypt. SpartanNash currently operates 160 supermarkets, primarily under the banners of Family Fare Supermarkets, Family Fresh Markets, D&W Fresh Markets and SunMart.